Washington state's largest fishing fleet berths here. Anacortes is an appealing destination in itself as well as a good overnight stopover if you are planning on catching an early morning ferry to the San Juan Islands. Anacortes, a beautiful waterfront city located on Fidalgo Island in northwest Washington, is known by some as the gateway to the San Juan Islands. But for many others, this picturesque city is a delightful, livable community that is a notable destination in its self that also can serve as a base camp for exploring not only the San Juan Islands, but other worthy attractions such as the many art galleries in the nearby town of La Conner, Deception Pass State Park, and the several tulip farms near the town of Mount Vernon. The city offers the visitor numerous accommodations including a wide selection of hotels, several bed and breakfast establishments, cabins, vacation rental properties and RV campgrounds. Dining opportunities abound as Anacortes hosts numerous cafes, restaurants, pizza parlors, a microbrewery, bakeries, coffee houses and espresso stands. 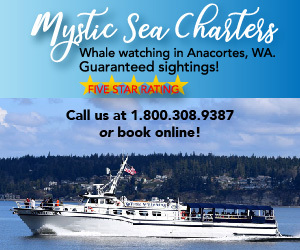 Anacortes is located approximately 75 miles north of Seattle, about 95 miles south of Vancouver, British Columbia, Canada and only 20 minutes from Interstate 5. 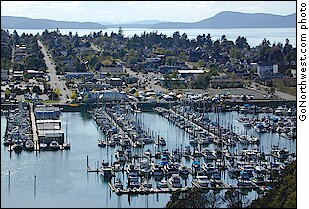 Though technically located on an island, Anacortes is separated from the mainland by a short bridge over Swinomish Channel to the east. To the south is Whidbey Island, which is reached by a short drive over the Deception Pass Bridge and the scenic Deception Pass. With Anacortes highly accessible from the mainland, the city is known for providing access to the San Juan Islands by way of ferry boat. Passenger ferries depart daily from Anacortes' ferry docks, providing smooth, safe, scenic transportation to four of the San Juan Islands: Lopez, Orcas, San Juan, and Shaw. The City of Anacortes also provides access to Whidbey Island by a bridge through Deception Pass. Go Northwest! travel guide provides you with all the visitor information you need to when planning a trip to Anacortes. Just use the navigation links in the left hand column or the drop down menu at the top of the page to find accommodations and lodging, restaurants and dining, activities and recreation, along with attractions and points of interest.